May 22, 2018 Thekchen Chöling, Dharamsala, HP, India – His Holiness the Dalai Lama met Vietnamese business leaders, artists, intellectuals and members of youth delegations for a second time today. First of all he undertook the preparatory ritual for a White Manjushri Permission, while members of the audience recited the mantra of Buddha Shakyamuni. “The 7 billion human beings alive today can be categorized into three groups,” His Holiness explained, “one that does not pay much attention to inner values, another that considers religion to be negative and one that has respect for spiritual practice. Everybody has an equal right to be happy, however, it seems that when faced with difficulties or desperate circumstances, people who have the support of religious belief find it easier not to lose hope. “Jainism, one branch of the Samkhyas and Buddhism do not believe in a creator. Apart from Buddhism, all other religious traditions accept the notion of an independent, permanent self, or atman. The Buddhist theory of dependent origination means this idea of an independent self is untenable. His Holiness explained that destructive emotions arise on the basis of misunderstanding the ultimate nature of things and that by understanding emptiness it is possible to eliminate them at the root. 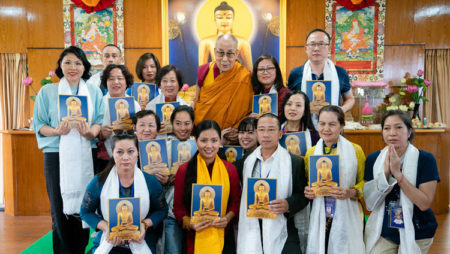 “In order to properly understand how the wisdom understanding emptiness serves to counteract destructive emotions, it is important to study psychology as explained in the classic India Buddhist texts,” His Holiness remarked. And these come from mental elaboration. To explain precisely this subject. His Holiness also explained that understanding emptiness is essential to the attainment of liberation and enlightenment. He further pointed out that the real source of suffering is maintaining an extreme self-centred attitude and the misconception of an independent self. He explained how a sense of concern for others helps counteract anger. After completing this overview of the Buddha’s teachings, His Holiness gave the permission of White Manjushri, which he reported having received from Tagdrak Rinpoche when he was still young in Tibet. At the end, he asked the Vietnamese to recite the Heart Sutra in their own language. As the session came to an end, he assured the group he would see them next year.